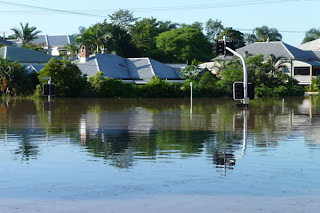 A Welsh girl in Australia: "Love you Queensland"
Even though most of the water has receded and the Summer sun is blazing there is still a lot of suffering and heartache in many towns and suburbs here in Queensland...and sadly also in other states in Australia. Water, whether it be river, rain or creek has left behind a trace to remind us of its power. they are only just beginning to count the cost of their losses. Many folk are starting to find some kid of normality﻿, but for some...well, their normality is a long way off. If you know a victim of the floods, keep them in your thoughts, or give them a call. The media has more or less packed up and left now, but the clean up and support still needs to go on. Tales of amazing people and of 'Australian mateship' are constant and everyone is doing their bit to help. Apart from the physical clean up, there are many ways that people are digging deep into their pockets to help. School children are donating gold coins, people from near and far are sending money, donating goods and services and even making some wonderful things for the children who lost their homes. Fundraising activities are happening all over the city and beyond. Last night, Brisbane Musical Theatre groups came together to raise some money for the flood disaster relief fund. It was an evening of talented local artists giving up their time to do their bit, and what a show they put on! As well as the live acts we were shown a clip that Harvest Rain Theatre Company have just recorded. I have mastered the art of linking a video (fingers crossed!) so that you can also share and enjoy - see below. The song/anthem "Love you Queensland" was originally recorded some 30 years ago, and it was somehow vaguely familiar to me. I haven't stopped humming it since last night! The clip also shows some footage of the swollen Brisbane river and aftermath of the flood. Photographs used in the Love you Queensland video clip are courtesy of Bruce Kirkland, Michelle Costello, Ashton Welch, Andrew Bartholomew, Arman Brkett-Saleh, Erik K Veland, Peter Turnbull, Brad Miller, Michelle Kenna, Ross Aitken-Smith, Renee Dillon, Kobie Hafner, Henry Gomez, Tareq Van Oosterom, Robert Cudahy and other anonymous photographers. dwli ar y 'new look' mae e'n edrych yn gret!